News on events and research in the diving, marine life and other underwater fields. Published by SCUBA Travel, the independent guide to diving around the world. 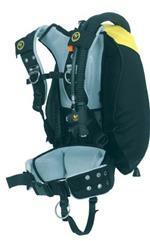 Poseidon are recalling their Besea W50 Diving Wings (also known as a BCD or stab jacket). The inner bladder inside the diving wing can break, causing the wing to fail as a buoyancy device. This poses a drowning hazard to divers. The recall involves the Poseidon inner bladders with batch number 5445 sold with the Poseidon Besea W50 wings. The inner bladder is located inside the outer cover of the wing. The batch number and “Poseidon” are molded on a tab located between the “legs” of the inner bladder. Manufactured in Sweden, they were sold from September 2007 through June 2008. If you have Poseidon wings that contain the recalled inner bladders then contact Poseidon for a free replacement. What do you think of this news item? Join a discussion. This "news" is about one year old, isn't it? No, the recall was 23 June 2009.